This is a list of available scholarships and internships for WGSS majors and minors. This is by no means an exhaustive list but will help give undergraduate or graduating students a good place to begin. 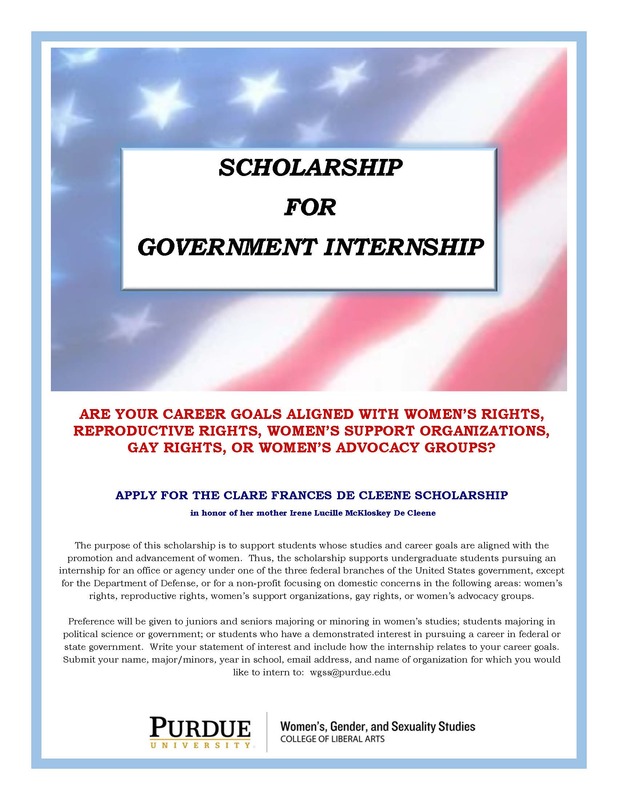 Purdue University, Clare Frances De Cleene Scholarship, in honor of her mother Irene Lucille McKloskey De Cleene. Applications being considered year-round. Dr. Anita Borg devoted her adult life to revolutionizing the way we think about technology and dismantling barriers that keep women and minorities from entering computing and technology fields. Her combination of technical expertise and fearless vision continues to inspire and motivate countless women to become active participants and leaders in creating technology. In her honor, Google is proud to honor Anita’s memory and support women in technology with the Google Anita Borg Memorial Scholarship. Google hopes to encourage women to excel in computing and technology and become active role models and leaders in the field. Google Anita Borg Scholarship recipients will each receive a financial award for the academic year. A group of female undergraduate and graduate students will be chosen from the applicant pool, and scholarships will be awarded based on the strength of each candidate’s academic background and demonstrated leadership. In addition, all scholarship recipients and finalists will be invited to attend a retreat at Google. We know how important a supportive peer network can be for a student’s success. The retreat will include workshops, speakers, panelists, breakout sessions and social activities scheduled over a couple of days. The Beinecke Scholarship Program was established in 1971 to provide substantial scholarships for the graduate education of young men and women of exceptional promise. The program seeks to encourage and enable highly motivated students to pursue opportunities available to them and to be courageous in the selection of a graduate course of study in the arts, humanities, or social sciences. Preference is given to candidates for whom the awarding of a scholarship would significantly increase the likelihood of the student’s being able to attend graduate school. Since 1975, the program has selected more than 500 college juniors from more than 100 different undergraduate institutions for support during graduate study at any accredited university. BestColleges.com partners with HigherEducation.com to provide students with direct connections to schools and programs suiting their educational goals. Our college planning resources have been featured by New York State, UCLA, and others with a vested interest in quality higher education. Each year the endowment offers approximately 10-12 one-year fellowships to uniquely qualified graduating seniors and individuals who have graduated during the past academic year. They are selected from a pool of nominees from close to 400 participating colleges. Carnegie junior fellows work as research assistants to the endowment's senior associates. Those who have begun graduate studies are not eligible for consideration. Students interested in this fellowship should apply through Purdue’s National and International Scholarships Office. CSIS offers full and part-time internships in the fall, spring and summer for undergraduates, advanced students, and recent graduates who are interested in gaining practical experience in public policy. Interns participate in a variety of activities that support individual programs, including research, writing, and project development. The Global Fellowship is our twenty-seven year-old program for smart leaders who are deeply connected to the needs and potential solutions that may work best for their communities. Any emerging social entrepreneur from any part of the world working to disrupt the status quo may apply. A community of like-minded social entrepreneurs and public service leaders, including the Echoing Green network of more than 600 Fellows working in over sixty countries all over the world. Whatever the answer to essential questions of society and individual human beings may be, education is surely its major component. But what would education be without its ethical dimension? Many of us believe them to be inseparable. That is why this Prize in Ethics Essay Contest was established in 1989 by our Foundation. Thousands of students from hundreds of colleges and universities across the nation have participated. Through their writing, they explored their concerns and beliefs, their fears and their hopes. While we suggest relevant topics each year, applicants are encouraged to choose any subject they feel strongly about, provided it is related to the domain of ethics. 1) Study/Research grants, which allow recipients to conduct independent research or study in over 140 countries. Applicants develop an independent project proposal, which may include university coursework, independent library, lab, or field research, or special projects in the social sciences, life sciences, or visual and performing arts. Applicants must identify a contact in their host country and procure a letter stating that he or she will serve as the applicant's institutional affiliation during the student's stay. In the majority of cases, students applying for study/research grants do so to fund a research experience. Students applying for study/research grants in the creative and performing arts must submit supplementary materials in addition to their application. 2) English Teaching Assistantship (ETA) grants are available in select countries and provide recipients with the opportunity to teach English as a second language to students from elementary school through the university level, depending on the country. ETAs serve as supplemental instructors in a classroom, generally providing conversation practice and teaching American culture for approximately 20 hours per week. Unlike research/study grants, for which an applicant must identify a specific location within the host country, ETAs simply apply to a country and those awarded grants are assigned a location based on need. Applicants cannot request specific assignments. In 2000, the ADA Education Fund created a Galbraith Fellowship program to honor the memory and ideals of progressive economist and scholar Dr. John Kenneth Galbraith. These Fellowships are awarded to outstanding college graduates or graduate students. Dr. Galbraith was a leading proponent of 20th–century American liberalism and through our Fellowship, his principles and values continue to influence modern-day thought. Fellows are selected from a national pool of applicants and must demonstrate strong research and writing skills, community service, a commitment to liberal ideals, and plans for future study or a career in public policy. In addition to giving our Fellows valuable experiences and assistance with their research, the ADA Education Fund provides a modest stipend. The Benjamin A. Gilman International Scholarship Program offers need-based grants for U.S. undergraduates of limited financial means to pursue academic studies or credit-bearing, career-oriented internships abroad in any discipline. Such international exchange is intended to better prepare U.S. students to assume significant roles in an increasingly global economy and interdependent world. The program encourages students to choose non-traditional study and intern destinations, especially those outside of Western Europe, and supports students who have been traditionally under-represented in study abroad, for example, first generation or minority students, students with disabilities, and those studying in STEM fields. Students who receive the Gilman Scholarship may also be eligible to receive an additional Critical Need Language Award from the Gilman Scholarship Program. Truman scholars are movers and shakers, agents of change, students who are committed to changing the world and serving the public. The Truman Foundation awards 60-65 scholarships annually to college juniors who wish to pursue graduate school in preparation for careers in public service. The scholarship includes up to $30,000 toward graduate studies, leadership training, and a 10-week Washington, D.C. Summer Institute following graduation. The Foundation defines public service as government employment at any level, uniformed services, public interest organizations, nongovernmental research and/or education organizations, public and private schools, and public service-oriented nonprofit organizations - in short, those organizations and agencies whose primary purposes are to help needy or disadvantaged persons or to protect the environment. Students interested in this scholarship should apply through Purdue’s National and International Scholarships Office. The Womenetics Advancing Aspirations Global Scholarship (AAGS) is a $15,000 essay competition that engages young people in pressing women's issues and connects students with thought leaders in impactful roles. The competition, sponsored by Discover, is open to all undergraduates and requires entrants to write a 2,500 word essay on one of five prompts related to business issues affecting women. Five finalists will be chosen, and of these finalists, one grand prize winner will receive $5,000 and four runners-up will receive $2,500 each. The five finalists will be invited to attend, expenses paid, the annual Womenetics Global Women’s Initiative, where the winner will be announced.